There are many are amazing animals that live in Northern Idaho. Two of the most famous of all them are the noose and the grizzly bear. These two North Idaho favorites have unique qualities. diameter. They can live up to fifteen to twenty year old. Moose are naturally extremely good swimmers. They can swim continously for several miles. Moose can hold their breath under water for thirty seconds or more. A moose can measure roughly six and a half feet tall, measured at the shoulder. Moose can run at 35 mph, and trot at 20 mph. Also they can weigh up to 1800 pounds, being the largest wilder herbivore in Idaho. Grizzly bears are the largest bears in North Idaho, as well as the largest predator. The easiest and most obvious way to tell grizzly bears from other bears is not their size but the distinct hump on their back. That hump is made of pure muscle connected to their frontal paws, giving them enormous strength for digging and clawing. Also, unlike other bears they have long claws, up to four inches long. A grizzly bear’s color can be blond, black, or brown. Adults can grow up to three to four feet tall on all fours, but when standing on their back paws they can be six to seven feet tall. A grizzly bear’s average weight is 300 to 600 pounds and some can weigh as much as 1000 ponds. Grizzly bears can live up to 30 years. They are very agile animals. 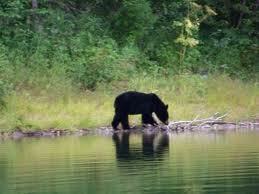 Can climb trees, are good swimmers, and can run at 35 mph. Originally the grizzlies were hunted to near extinction. The United States added grizzly bears to the endangered species list, illegalizing hunting the grizzly bears. But today in the Northwestern United States they are no longer endangered, but in some places, like Idaho, they are still illegal to hunt. Like most traits, there are advantages and disadvantages. For example, a moose uses its large antlers in a wide space to rut (fight) with other moose or to fight off predators. A disadvantage to these antlers would be in confined spaces a moose’s large antlers could get it stuck. An advantage a grizzle bear has is that it can fun very fast, up to 35 mph, but only for short bursts. A disadvantage would be, if a grizzly does use that burst of speed for too long than they become extremely tired and fatigued. Northern Idaho is fortunate to be home to such massive animals. 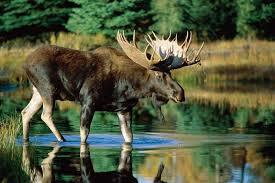 The moose live in the forests and the wetlands while the grizzlies live in the forest and in mountainous terrain. And it’s because of Idaho’s low population that the grizzly bears and the moose have such a large habitat. Both of these animals are amazing, and both of them are native to Northern Idaho. Looking for a North Idaho Adventure, Visit Vacation Rental Authority to find great FAMILY VACATION IDEAS.